Slice the streaky bacon into thin long pieces. Approximately 1 inch long and 0.5 cm wide. Lightly oil the pan and cook bacon in batches over a medium to high heat until they are bronzed, crisp and all the bacon fat has rendered off. Make sure you do not overcrowd the pan with bacon otherwise the bacon will stew and become soft. When the bacon is cooked, remove the bacon and reserve the bacon fat in the pan. Place the bacon on kitchen paper so it is evenly spread out. This will help the bacon to remain crispy. 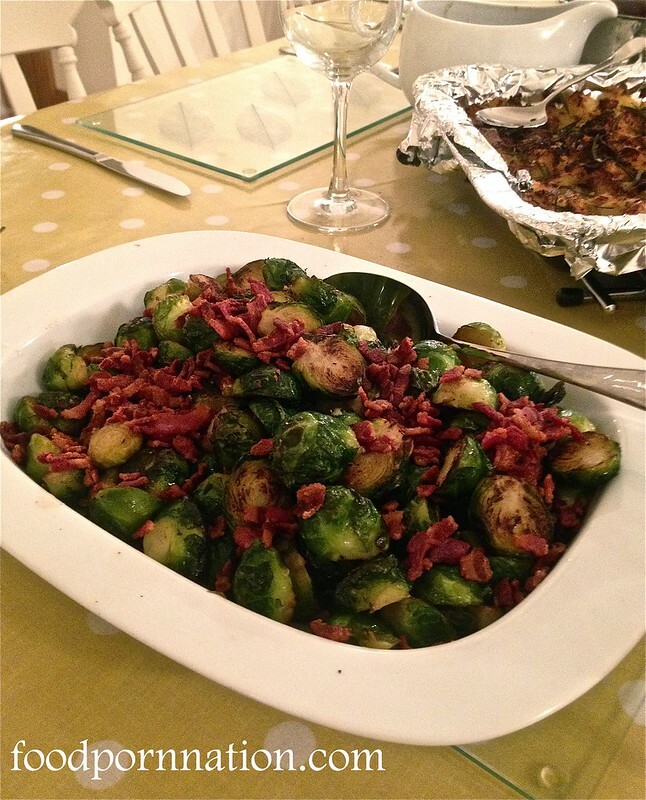 While the bacon is cooking, boil the brussel sprouts in salted boiling water until they are half cooked. Roughly 3 minutes. You can spoon one out to test that they are still firm. Run under cold water to stop the cooking process. When cooled and ready to handle, slice them in half so they keep their shape. Set aside. When you have finished with the bacon. Reserve half of the bacon fat from the pan to be used for later. With half of the bacon fat left in the pan, add butter and oil until melted. The oil will prevent the butter from burning. Cook the brussel sprouts on a high heat until the edges begin to darken. Set aside and repeat this step with the other half of the bacon fat, butter, oil and the remaining brussel sprouts. Return the first batch of the brussel sprouts to the pan and add one half of the crunchy bacon bits and stir through for 2 min. Place the brussel sprouts into a serving dish. Add more butter and mix through until melted through. Top with the remaining crunchy bacon for serving. Serve as a side for any roast, like my Roast Pork served with Caramelised Apples, White Wine & Sage sauce. you had me at buttered and bacon! Me neither! But butter and bacon makes everything taste better! This looks delicious with all that bacon. Happy new year beautiful, hope 2015 brings you more foodporn! Yes I went travelling for 4 months and now I have moved to London. It’s pretty exciting. Yes Borough Markets are amazing. They actually have a stack of markets that I need to hit up!